Colonial Star Burgundy Collection, by Olivia's Heartland. Dress up your bedroom colonial style with this beautiful patchwork quilt collection, featuring plaid and checked fabrics in burgundy and tan, with applique stars. 100% cotton. We are offering pillows and shams for those who want to add to their bedding set, on a special order (no returns) basis. 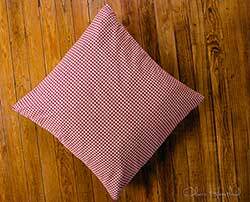 This is the Burgundy Check Fabric Euro Sham. 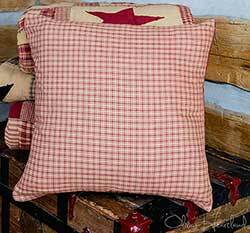 Designed to coordinate with several of our primitive bedding collections, this 16 inch pillow cover is made with a burgundy and tan plaid fabric. 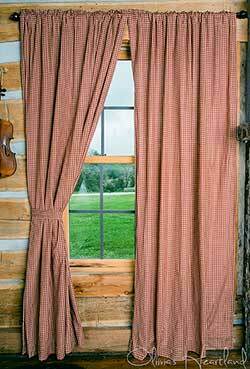 The all-time classic country look for your living room, these curtains features a gingham checked pattern of burgundy red and tan. Features a classic checked pattern of burgundy and tan. Check size is approx 3/8 inch. This is for the Valance. 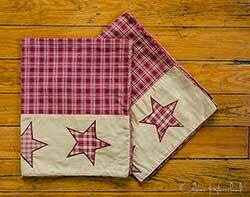 Features a mix of mix of burgundy and tan plaids, with appliqued stars. Comes in twin, queen, king, and California king size. We are offering pillows and shams for those who want to add to their bedding set, on a special order (no returns) basis. This is for the luxury-sized Pillow Cases for Colonial Star Burgundy Quilt. We are offering pillows and shams for those who want to add to their bedding set, on a special order (no returns) basis. 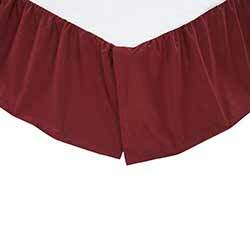 This is for the standard-sized Pillow Cases for Colonial Star Burgundy Quilt. 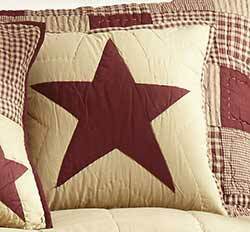 Perfectly compliments our Burgundy and Tan Jamestown and Colonial Star Quilt sets! California King size measures approx 72 x 84 x 16 inches. 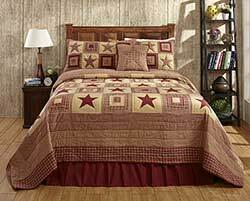 Perfectly compliments our Burgundy and Tan Jamestown and Colonial Star Quilt sets! Twin size measures approx 72 x 80 x 16 inches. 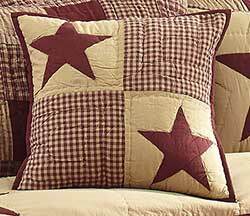 Perfectly compliments our Burgundy and Tan Jamestown and Colonial Star Quilt sets! Queen size measures approx 60 x 80 x 16 inches. Perfectly compliments our Burgundy and Tan Jamestown and Colonial Star Quilt sets! Twin size measures approx 39 x 75 x 16 inches.